Calorie Calculator: How Many Calories Should I Eat? One of the biggest questions surrounding weight loss is: how many calories should I eat? For most people, their answer tends to be, “I don’t know.” Using a calorie counter to calculate and track calorie intake can give you a number, but sticking to it can be a little more difficult. Reducing calories for weight loss involves a few steps and familiarity with a few concepts. But once you understand them, you can put yourself on the fast track to weight loss—and in a healthy way! There are a couple of ways you can estimate your caloric requirements to help you reach your weight loss goals. The easiest way is to take your current weight and multiply it based on your current “workload.” Your workload simply refers to how active you are. Very Light: little activity outside of daily life. This would be someone who is relatively sedentary, has a desk job, and does little to no exercise. Light: This would include activity like walking at a level surface at a pace of 2.5 to three miles per hour, garage work, housecleaning, golf, carpentry, or playing with the grandchildren. Heavy: This activity level would include walking uphill, digging, climbing, vigorous exercise, and sports like basketball or soccer. Lastly, if you want to lose weight, it’s advised that you enter your goal weight under “Weight in Pounds” in the calculator above, as opposed to your current weight. For example, if you’re 160 pounds and want to get down to 150, enter 150 pounds into the table. The reason why you do this is because in order to lose weight, you must create a caloric deficit—meaning you need to be expending more calories than you’re consuming every day. If your weight hasn’t changed in a substantial period of time, then you’re at a calorie balance. In this case, you can remove 250 to 500 calories per day to achieve a deficit. In order to do this, track your food consumption for three to 14 days to see how much you’re eating, then make the cutbacks accordingly. Now that you know your target caloric intake, let’s step back a bit and discuss what a calorie is, the best kinds of calories to consume, and how you can still eat well while cutting calories. The easiest way to understand calories is to think of them as energy for your body. They are the fuel that keeps your system running. Your brain, vital organs, metabolism, and respiratory and cardiovascular systems need them to keep your body running efficiently. At the most basic level, calories are much like the oil and fuel you put in your car. Therefore, we all must consume a flat number of calories every day simply in order to exist. But your calorie requirements might be very different from everybody else’s. Just like small cars, pickup trucks and transport trailers have larger gas tanks and require more fuel to travel a similar distance; the situation is similar when it comes to your body and caloric requirements. Going back to the basics, consider this fact: for every liter of oxygen you consume, you burn five calories. Oxygen is essential to function and the bigger you are, the more oxygen you consume and the more calories you need in order to simply breath. It’s also why activity and exercise are so beneficial for balancing caloric intake—the harder your body is working, the more oxygen it needs and the more calories are burned. For example, walking slowly at surface level at a pace less than two miles an hour will require your body to work twice as hard, meaning your oxygen consumption will double. But doing seemingly nothing also requires calories. In fact, the calories you consume when your body is at rest—doing nothing but laying down and breathing—is known as your “basal metabolic rate” (BMR), or resting energy expenditure (REE). Believe it or not, this accounts for 60%–75% of your daily caloric expenditure. One’s BMR varies depending on age, weight, height, gender, body composition, and genetics. How many calories you should eat depends on your weight and body composition. A 200-pound male needs more calories than a 170-pound male, who in turn needs more than a 150-pound female. 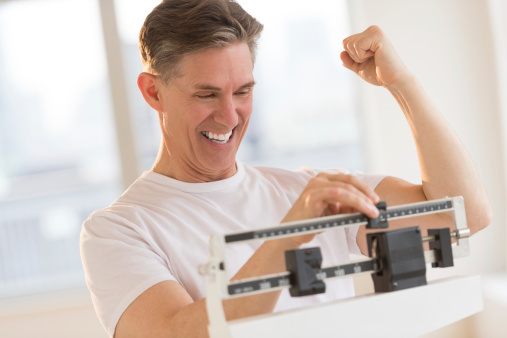 What’s even more interesting is that depending on body composition, the same caloric intake on a lean 200-pound male (whose body is composed of mostly muscle) will have different effects than it would on an overweight 200-pound male (whose is composed of mostly fat). The differences can come down to what kind of food they eat, their activity levels, and something called “macronutrient ratios.” As you will soon learn, macronutrient ratios play a highly important role in weight loss. In fact, counting macros is just as important as counting calories. But we’ll get to that shortly. Most packaged food comes with a nutrition label detailing the breakdown in fat, carbohydrates, and more of its contents. The percentages you see displayed on these labels are for a daily caloric intake of 2,000 calories. But as mentioned earlier, you could need more or less than that, so pay attention to serving sizes when reading these labels instead. Let’s get to macronutrient distribution now, which is rather important. Macronutrients are the three major nutrition sources: carbohydrates, fats, and proteins. Protein and carbohydrates each contain four calories per gram, while fat has nine calories per gram. Your macronutrient ratios depend on individual factors like age, metabolism, and body composition. That said, you need all three of them in your diet to be healthy. Any diet that is too low in fat or carbohydrates, for example, can cause some ill side effects. To calculate the number of calories consumed, you simply consider the macronutrient type and multiply the amount eaten in grams by either four for carbs and protein, or nine for fat. Depending on the factors outlined above, calculating calories is all about how many grams of a particular macronutrient you should eat in relation to your body weight. Government recommendations, for example, are to have 0.8 grams per pound of protein. However, if you’re on a fat loss diet and are also interested in retaining muscle mass—which is very important for seniors—you should be consuming at least one gram of protein per pound. However, you can go even higher if you elect to diet for weight loss. In fact, when your calories go down, your requirements for protein go up. The best way to track your macros is by using an app like “My Fitness Pal” or a similar calorie counter. You can find several ideas here. These apps can be useful in counting calories and helping you lose weight, but some aren’t overly customizable, so it’s important to keep the tips provided here in mind when using any app. A common misconception about dieting is that fat is the enemy. Although it’s the enemy on a human, this is not the case when it comes to diet. Consuming fat does not necessarily mean you will gain fat. Most of the excess weight Americans are carrying is from an increased consumption of fast-absorbing carbohydrates, like table sugar, high-fructose corn syrup, and the various “oses” (like glucose, fructose, or sucrose) that are added to processed foods—and not from healthy fats at all. The best place to cut calories is by reducing the amount of processed foods in your diet. Dieting is not synonymous with starving yourself. In fact, you’ll likely notice you feel fuller when you diet because healthier foods are more nutrient-dense, have slower absorption rates, and increase satiety, which is the feeling of fullness. The selection of your macros is very important in order to leave you feeling full and achieving the desired weight loss results. Here are some examples of the optimal foods to include in a successful and satisfying diet. It should be noted that if you’re vegetarian and rely on plant sources for protein, it’s recommended you double your protein intake. These sources are not complete sources of protein, so you’ll get an inadequate amount if you stick to the regular guidelines, which are based on animal sources. Protein and complex carbohydrates (unrefined, “brown” carbs) are excellent foods for satiety. The body takes longer to break them down and absorb their nutrients, which stimulates positive metabolic impacts and keeps you feeing full. Secondly, these carbohydrate sources are typically high in fiber, which can also increase fullness. There are also positive metabolic effects with such a diet, but they are well beyond the scope of this article. The best way to approach a diet or a weight loss program is to focus on long-term results and short-term, incremental goals. In most cases, a well-constructed diet will lead to weight loss of a half a pound to two pounds per week. If you’re losing more than that, there is a good chance your diet will be unsustainable and will not last. Focusing on long-term, positive lifestyle changes including improved diet and increased exercise are the best way to keep weight off and improve overall health. Furthermore, increasing energy expenditure through exercise can help create a caloric deficit, which is essential for weight loss. Staying away from diets that erase carbohydrates or fat and promise fast results should be avoided. These are known as VLCDs (very low-calorie diets) and will lead to future weight gain, often in excess of what weight was lost during the diet. The best way to lose weight is to include all your macronutrients and take a slow and calculated approach. In order to get all your nutrients, general guidelines suggest that men should rarely diet at less than 1,600 calories and women should rarely consume less than 1,200 calories daily. These numbers are usually the standard for a “low-calorie diet,” or LCD, used to enhance weight loss in obese individuals. One of the most overlooked aspects in creating a successful diet is motivation and reward. Therefore, set some incremental goals. If you lose weight for four consecutive weeks, for example, reward yourself—just not with food. Buy some new clothes, head to the movies, or head to the go-kart tracks with the grandkids. Whatever you choose, do something—tangible or intangible—to reward yourself for your accomplishments. Sources:Paddon-Jones, D., et al., “Protein, weigh management, and satiety,” American Journal of Clinical Nutrition May 2008; 87(5): 15585–15615; http://ajcn.nutrition.org/content/87/5/1558S.long. Westerterp-Plantenga, M., et al., “Dietary Protein – it’s role in satiety, energetics, weight loss and health,” British Journal of Nutrition August 2012; 108(Suppl 2): S105–12, doi: 10.1017/S0007114512002589. “Why is gradual weight loss better than a crash diet?” National Health Services web site, March 2, 2015; http://www.nhs.uk/chq/Pages/2468.aspx?CategoryID=51.